Why is the horseshoe considered the symbol for a magnet? Why were magnets made in this shape? Why aren’t neodymium magnets made in horseshoe shapes? Can I get a neodymium horseshoe magnet? Google provides a quick answer to the question, but not the whole story. Why are magnets shaped like horseshoes? A quick search yields a number of sources that all say basically the same thing: It provides more strength. Because there are 2 poles right next to each other, we feel more pull force to a steel surface with this arrangement. Comparison of horseshoe and cylinder magnets stuck to a steel plate. Notice the larger, stronger magnetic field within the steel from the horseshoe. This helps provide more pull force. This is true. Using two poles right next to each other like this can be a great way to get a strong hold. We’ve shown a few examples using neodymium magnets with opposite poles right next to each other, though not in a complete horseshoe shape. This includes the alternating magnets of the Magnetic Knife Holder and the alternating poles of magnets used inMagnetic Spice Jars. Even the magnet-in-a-steel-cup design of ourMounting Magnets gets more strength using this basic idea. This really isn’t the whole answer, though. In fact, we’d say that more pull force is not the primary reason for the U shape. If getting 2 poles together were the only goal, why not put two disc magnets or blocks side by side, and not waste all that extra magnet material going around a large “U” shape? A big reason for the “U” shape is to avoid demagnetization with older magnet materials. Coercivity: How strong does a magnetic field have to be to demagnetize a permanent magnet? 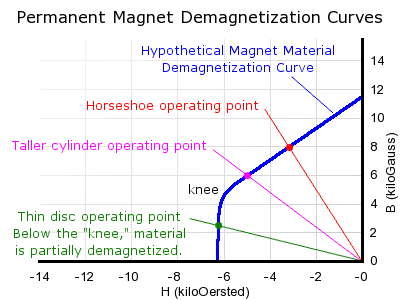 Demagnetization or “BH” curves for different magnet types. Early magnets made of iron would not remain magnetized for long. These materials have a very low coercivity. So low, in fact, that the magnet tends to demagnetize itself with its own magnetic field. As one looks at the history of the development of newer, more powerful magnet materials, it isn’t just about greater pull force strength. It is also a history of increasing coercivity as well. Neodymium magnets are not only stronger than other magnet types, they also have a much higher coercivity. That’s why they don’t tend to slowly demagnetize over time. Why is a horseshoe shape good for coercivity? Three load lines are shown for different magnet shapes in free space. Taller shapes operate “above the knee” and avoid demagnetizing themselves. Even with the limitations of early magnetic materials, there are ways to improve coercivity: the “staying-magnetized” performance. For example, a long cylinder shape stays magnetized better than a thin disc. This idea is commonly used with low-coercivity magnetic materials, such as iron or Alnico magnets. For example, the magnets used in door and window alarm sensors are usually long, cylindrical Alnico magnets. We discussed the influence of shape on magnetization in some detail in our in-depth article about Temperature and Neodymium Magnets. A horseshoe shape is kind of like a more extreme version of a long cylinder. It changes the load line (or Permeance Coefficient) of the magnet, so that the magnet is not tending to demagnetize itself. A horseshoe shape is chosen so that the magnetic material can stay magnetized. It is a high coercivity shape, of sorts. With an earlier magnet material like Alnico, you couldn’t use a thin disc shape like we can with neodymium magnets. It would quickly demagnetize itself. The use of a steel keeper on a horseshoe magnet is another step in improving this kind of performance. It helps the magnet not demagnetize itself even more than without the keeper. In the video below, we show how to re-magnetize a horseshoe magnet. We’re using the HS1 Alnico magnets available in our Horseshoe Magnets section, and magnetizing them with some strong, DAA neodymium cylinder magnets. We could also have used the larger HS2 for the same demonstration. The electronic pole identifier can be found here: EPID. The red and black plastic coated magnet is the handy D68PC-RB magnet. Find other pole identifying products here. Can K&J provide neodymium magnets in a horseshoe shape? Neodymium magnets are strong. They provide more pull force. You can find a stronger magnetic field around them, compared to other types of magnets. They also have a much higher coercivity than other magnet types. Unlike the Alnico magnets discussed before, they generally don’t demagnetize themselves. It’s part of what makes them so amazing. Except for a few cases (involving high temperatures or very thin magnet shapes), neodymium magnets generally won’t demagnetize each other. To demagnetize a neodymium magnet, you really need a stronger magnetic field than a neo magnet can provide. The whole motivation for making magnets in a horseshoe shape (increasing coercivity) is basically irrelevant. You just don’t need this shape. Neodymium magnets do not need a horseshoe shape or a keeper. In fact, they can be stored with two neodymium magnets repelling one another. It wouldn’t demagnetize them any more than having a single magnet sitting on the shelf. The traditional iron horseshoe magnet, so shaped to avoid demagnetization in its own demagnetizing field, is now a museum piece. — J.M.D. Coey (1996). Rare-Earth Iron Permanent Magnets. Oxford Science Publications. If you want the improved (pull-force) strength of having two poles near each other, you don’t have to resort to a horseshoe shape. You can put two magnets side by side, or use a steel structure like our Mounting Magnets do. Why pay for the added expense of all that unnecessary added neodymium magnet material? We also don’t provide “U” shape neo magnets because neodymium magnet material is so hard and brittle. A “U” shape tends to concentrate the stress in the curved part of the U. We would end up with a lot of broken magnets! Please, don’t tell Joe Magneato he’s obsolete! Previous Previous post: dontknowmeatall comments on You can ban one item from ever existing again, and everybody would know it was you, what would you ban?